What were the heterodontosaurs like? The heterodontosaurs were fast-moving herbivorous dinosaurs that averaged about 3 feet (1 meter) long. They had canine-like teeth, relatively long arms, and large hands. They were also some of the most primitive ornithopods. Some scientists believe that the animals may have been the first ornithopods with teeth; they had long fangs used for cutting and slicing vegetation or for defense. The animals’ hands also may have had some grasping abilities, and they may have used their hands to dig burrows that could have been used as shelter or as estivation “dens” (estivation is lying dormant during the hotter times of the year, which is the opposite of hibernation some animals experience in the winter). Some heterodontosaurs also may have replaced all their teeth at once, depending on the amount of wear. 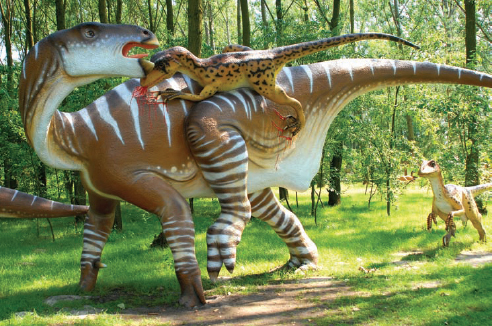 An Iguanodon is attacked by a group of of Deinonychus. Iguanodons were strong and fast herbivores that may have fended off such attacks by using its spikey thumbs (Big Stock Photo).